The Mount Saint Mary College Women's Swimming team opened the 2017-18 season with a 190-32 Skyline Conference victory over visiting Purchase. NEWBURGH – The Mount Saint Mary College Women’s Swimming team opened the 2017-18 season with a 190-32 Skyline Conference victory over visiting Purchase. Freshman Shayla McCarroll began her collegiate career with three individual victories. McCarroll scored wins for the Mount in the 50 and 100-yard backstroke events and took the top spot in the 100-yard individual medley. Her winning times came in 31.66 seconds, 1:07.88 and 1:10.88, respectively. Junior Kyra McNamee continued her standout career for the Knights with a pair of individual wins and was also a part of two winning relay teams. 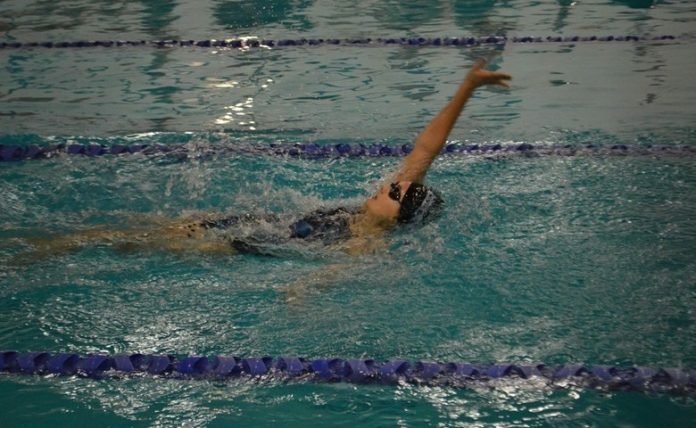 She scored wins for the Mount in the 100 and 200-yard freestyle races, posting times of 59.18 seconds and 2:09.30. The Mount, who won each event in the meet, posted wins in both the 200-yard medley and 200-yard freestyle relay races on Saturday. The team of Daley O’Keefe, Marissa Catania, Lauren Schroeder and McNamee scored a medley win in 2:01.93, while Abby Bemer, Stephanie Adams, McNamee and Schroeder swam to a win in the freestyle race in 1:55.54. Saturday’s win pushes Mount Saint Mary to 1-0 overall and 1-0 in league action heading into a non-conference meet at Wilkes on October 21. Meet time is scheduled for 1:00 p.m.